Strangely, travelling is one of my more relaxing experiences. Not to overlook the strain of the TSA (complicating matters is the fact that I saved space in my suitcase by wearing my bulkiest jacket and high-heeled boots, not exactly easy to take off & put back on in a rush) or even the physical strain of lugging a backpack and suitcase for 12+ hours (ah, carry on). But at least things are simple. I never bother with WiFi while flying, so I am completely unlinked from the Internet for the duration of my trip, and have nothing to do but read, jot notes, and navigate terminals. Focusing on one thing at a time is refreshing. And even after as much flying as I’ve done over the past 18 months, there’s something to be said for getting a window seat at 40,000 feet up. My journey to California was actually a fair bit more than 12 hours. This wasn’t only because of time zone differences–the longest portion of my journey took me from my doorstep to the C Terminal at Reagan National Airport. With a stop of about 10 hours at the baggage claim. Pros of booking early morning flights: it’s cheap; setting off early allows me to cross the North American continent and arrive at my sister’s with some daylight left. Con of booking and early morning flight out of DC: the buses were not running early enough to get me to Reagan in time to go through security, or even walk across the terminals. You can read the rest of my adventure at Reagan International at the review I wrote for SleepingInAirports.com. This was the last time I expect to be at Reagan for a while–if I need to fly anywhere over the next 6 weeks, it will be because of an emergency–so I didn’t mind a last hurrah sleepover. That doesn’t mean I wasn’t a teeny bit disgruntled at the fellow in the distinctly unslept-in suit behind me in line who complained about how early it was in line for check n at about 4:30 am. Oh, about that 6 week figure–DC is a wonderful city, and I have made many friends here. But a number of push/pull factors, from the financial to the familial, have made me decide that I’ll be moving back to Wisconsin by June. Lots of hopping about, I know. But in the meantime, the reason for this particular cross-country flight, was to visit my sister, an English grad student who is currently stuck in the state of California for a year because of residency requirements. At the Sacramento airport, I, or at least the plush Eighth Doctor who is my travel companion (perhaps I am his), was greeted by my sister holding up a silly sign. First things first: after eating nothing but airport pretzels all day (I said travel was relaxing, not good for digestion), we broke my fast on In-n-Out Burgers, devoured as my sister drove at something like 80 miles per hour on a California rural roadway. At last we arrived in Davis, a town of 60,000 or so people that looked disconcertingly like a mixture of the Midwest and California, and not at all like DC. The mountains weren’t visible in the torrential downfall I arrived in, but at least the drought was being broken. My sister’s apartment, shared among 3 English grad students, was very scenic–with everything from fresh flowers to Waterhouse prints to bike maps of Davis and, the crowning distraction, a poster of Tom Hiddleston as Coriolanus. (As a self-indulgent aside, there’s a simmering debate over exactly how much that shower scene was meant to pull in female viewers. In context, it’s very painful and disturbing, but I think the fact that they put it on the posters is giving ammo to one party). 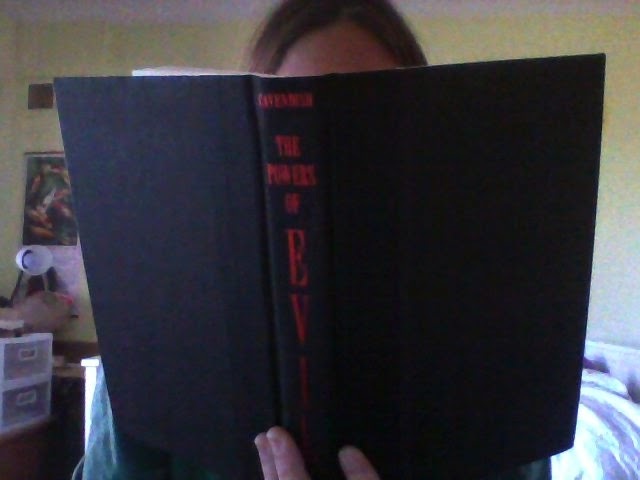 The Powers of Evil by Richard Cavendish is actually an excellent reference for any dark fantasy or horror writer. Some of his theories may be out of date–the book is from 1975–but it’s very fluently written and occasionally, as I discovered reading the introduction in the dark of a storm-tossed California night, bloody terrifying. I spent most of Wednesday recovering from jet lag and enjoying a tour of Davis, from the Delta cafe to the university library. It was a glorious library. On Thursday, there was a TA strike at the University of California, and my sister’s classes were canceled in solidarity. And then–perhaps not so much in solidarity, not that I don’t wish the striking workers the best–we went up to Napa and Sonoma. My sister worked in the liquor department of a grocery store long enough to recognize some of the names, while I just dazzled at the sight of grape vines, hills, flowers, and buildings that ranged from California ranches to Mediterranean villas of debatable taste, or at least fittingness with location. Apparently there is an honest to god castle somewhere in the valley, but I didn’t get to see it. Perhaps because we didn’t do our wine tasting until later in the day, after we’d have a full picnic lunch at Sattui and gelato in between window shopping in downtown Sonoma. I have no taste for wine, none at all. It is an acquired taste, one I do not have the time or the depth of wallet to acquire. And as some have pointed out, there’s a narrow delineation between “acquired taste” and “Stockholm syndrome.” I’ve taught myself to like tofu, sushi, green beans, and black coffee, but wine continues to elude me. I may have scandalized our, ah, server? Administrator of the wine tasting? Holy high priest of the vine? when I honestly answered “sweet” when asked what wines I preferred. “We don’t get those out here,” he said, in a tone of voice that is the equivalent of a Catholic crossing herself. Or maybe that was just my self-conscious imagination. I did get to try a port for the first time, and it was splendid. Dessert wines and Door County fruit wines for me only, I think. Not that I didn’t taste any of the others. And, to be polite, I finished everything they poured me (although I knew this wasn’t necessary). And so I experienced the most interesting state of floaty numbness, starting from the mouth and spreading outwards. I’m not sure I’d call it intoxication so much as anesthesia. You could have performed oral surgery on me and I’d have remained cheerful as bee buzzing from valley flower to valley flower. My sister, who as a graduate student in Northern California is far more acquainted with the juice of the vine than I am, was unaffected and drove us home without incident. Friday was another relatively non-eventful day–I had some client work (luckily nothing came up before I napped off the wine) to catch up on and generally enjoyed my sister’s apartment swimming pool. Over the weekend, Davis had a tiny little conference on the history and philosophy of science. I’d taken one course on that in college and so knew enough to be fascinated with the presentations, even if I didn’t entirely understand them. There were some heated debates about quantum mechanics that I just couldn’t follow, however much I thought I’d absorbed the concept of quantum whatever from Dan Simmon’s Ilium (that reminds me, I should do a book review one of these days. Ilium: riotous good fun. Olympos: terribly disappointing follow up. How could you go so wrong with Greek gods, robots, cosmic horror, time travel and quantum entanglement? Well, you could add random subplots with black hole bombs and Islamophobia aftertaste, plus some pretty dull depictions of the Amazons, for a start. Ooo, lady warriors are shrieking harridans, what a fascinatingly unique take, Mr. Simmons). For a less intellectual palate chaser, my sister and I went to see Captain America: The Winter Soldier. So nice to see Washington, D.C. again, even if it was frequently being blown up. Although not as challenging to the gray cells as quantum mechanics, it was engaging on more than a flashy pyrotechnical level. I teared up a few times, not just because I’m pretty sure I and/or several of my friends died during the climax (maybe not–my house is on high ground…but no spoilers) and there’s plenty of political commentary to chew on. Speaking of movies, the next presentation I went to at Davis was one on James Cameron’s Avatar and activism. A year to the day of the colloquium, I had just returned from Ghana, and I still have a number of ideas for stories to write that include environmental sci-fi themes, so there was a lot in the presentation to interest me and also much I should take to heart, well-intentioned white writer that I am. As you might guess from the fact that the approach is described as “global feminist environmental justice cultural studies,” it’s a complex issue. Marxism was also involved, but then when isn’t it. Meanwhile, I’m belatedly vindicated in my disappointment walking out of the theater years ago, because while I could enthuse to a limited extent with my friends about the fantastic graphics, the tired old storytelling and sexist storytelling (I wasn’t yet as conscious of the racial issues) filled me with a deep sense of disappointment. Meanwhile, Winter Soldier is proof that you can tell a story that will actually have people arguing politics over it, and entertain without completely marginalizing everyone who isn’t a white male (obligatory “Give us a Black Widow” movie here. Additional “I’d really enjoy a Falcon movie,” because Anthony Mackie is delight personified). For all that, it was interesting to see how indigenous groups harnessed Avatar and James Cameron himself to further their causes. Presentations and media crit/consumption aside, the other thing I did a lot in California was eat. Davis, not unexpectedly, has a farmer’s market, which not only provided my sister with a supply of fresh vegetables to experiment with but also gave me a one-stop location to sample various eateries she has been telling me about since she arrived in September. And then there were all the other places–from the Delta Cafe (the full name, as I discovered on my last day, was Delta of Venus, and let’s laugh together at all the obvious puns. The graffiti in their bathroom was something to see, too) to the Black Bear Diner to the mysteriously good “breakfast place” in the nearby hamlet of Winters my sister had heard rumor of. I got my sister back into the habit of eating breakfast, which finals week had knocked out of her, and introduced her to eel sushi. She introduced me to actually cooking with an oven and a well-stocked, well-organized kitchen. She also introduced me to that greatest of US Davis celebrations, lauded by multiple fliers, plenty of chatter, a myriad of closed-off roads, and a disconcerting number of police and campus statements asking people to please not repeat incidents involving alcohol and other such illegalities. Although the poor people at the coffee house we went to were neighbors of a fart house that had been welcoming visitors to the fraternal bosom of Davis with loud and profane exclamations since 5 that morning, literally everyone else in the entire city was excellently behaved. Included the students in the Picnic Day Parade who were protesting police violence. On a lighter note, there was the Whimcycle club (from tandem bicycles to arm power-driven bicycles to converted motorcycles to a bike that incorporated a hammock for the driver’s slumbering offspring), a Cycle de Mayo and a Tour de…something with chickens (you had to be there), and the classics department of Davis sporting a Greek Underworld masquerade. Tantalus wore a colorful, fish-patterned shower curtain to represent the pool he is forever drowning in, which along with the ripe bunch of plastic grapes over his head threw me a bit because I wondered if he was supposed to be Dionysus thrown into the sea and turning sailors into dolphins. Sort of outsmarted myself there (I blame The Powers of Evil). The next day, my penultimate day in California, I attended my first craft fair of 2014. It looks like adorable crochet animals are in, which I do not protest in the slightest. 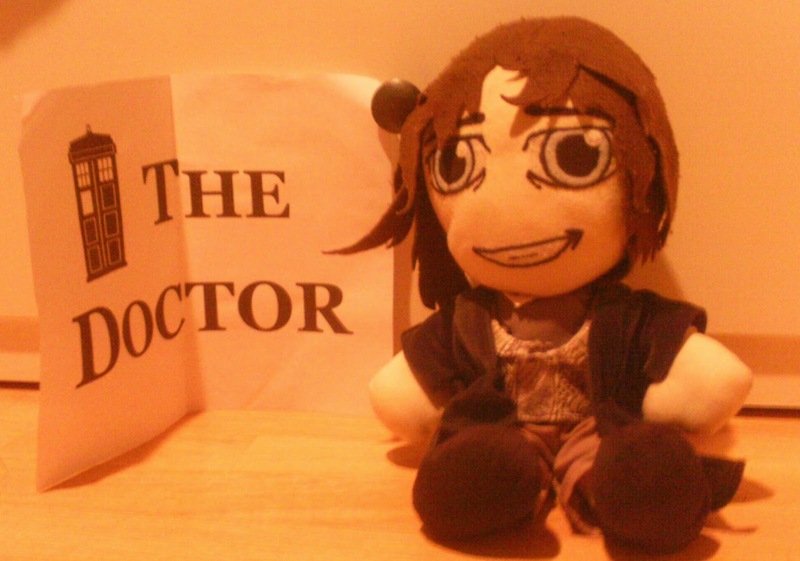 Plushie Eighth Doctor did not get a little friend, though–I had no room in my luggage. We came home to some tragic news of a loss in the family back in Wisconsin. Frankly, it’s a bit eerie–disaster struck back home the day my sister left me after her visit to DC last year. Does the universe not want us to ever split up? Are we cursed? Is it a curse I can only break by doing the one thing I am least inclined to do–stop seeing my sister? I’m a rationalist, a philosophy major, a skeptic. But I also have a very deep sense–or call it a willingness to see–patterns. This is one of the few psychological tendencies of mine that actually appears in my writing. In my stories, perhaps especially the unpublished ones, structure recurs, patterns emerge, and the predominant themes are of echoing and returning. More echoes than returns, to be honest. Ever since I started writing, I have wanted to keep a sort of realism in place, and part of that realism, I am painfully aware, is that too few things ever really return. My sister used to be very “into” irony (being destined for a PhD in Literature makes one destined to get “into” literary devices, I suppose), and now I think I’m growing into it–dramatic irony being a wonderful tool. When it happens in real life it’s more than a little unsettling. I have had times when I felt like a character in a story, where my actions were not constrained yet still felt recorded; incidents which I could look back on with a sense of satisfaction. It’s much less fun to feel like you’re in a horror story. Perhaps I had read too much of Cavendish’s Powers of Evil. If it helps, my dark feeling of doom was redeemed by a few grace moments on my trip home. My layover was in Milwaukee, and my mother came down to meet me at the gate. If you ever get the chance to meet friends during a layover, I highly recommend it–so long as you’re prepared to go back through security again. Which I was. I had an hour. Time passes quickly when you’re talking with someone you haven’t seen since Christmas, though, and next I knew my flight’s boarding call was announced. As I got to security, my name was announced. I’ve had that happen twice before–once in Washington D.C. without even realizing it (“Don’t tell me you’ve been sitting there all this time,” the stewardess told me as I ambled up to the gate. “Um, no, I’ve just arrived,” I blithely replied. “Right answer.”) and once in Milwaukee just after I’d got through security. That last time had led to me dashing for my gate, something I promised myself I would never do again. Just that morning in Sacramento I’d seen a well-dressed man running for his gate and laughed internally with a feeling of superiority. It’s not that I genuinely thought I would miss my flight, but I’m a worrier by nature. So long as I was running, I wasn’t worrying. It probably took me the entire flight to DC to recover from that mad dash, though. I returned to the district to pouring rain (I’m a rain-bringer, I guess). As the plane taxied to the terminal I got a text from my friend asking if we had time for our Tuesday night writing/library parties. Well, sort of. And I’m glad I did drop by to the library, because it gave me the chance to say goodbye to one of the Palisades librarians who is being moved to a different branch next week. She’d got the news suddenly and wasn’t sure if she’d have the chance to see me one last time in person. I’m touched to be remembered (I guess becoming a weekly regular does make a difference). I wish her the best. Still, it’s perhaps a bit cruel to surround oneself with food anthologies when you have nothing to eat but leftover airplane pretzels. Wednesday was taken up by catching up on work and undertaking a grocery pilgrimage to Trader Joe’s. How’s that for a predictable pattern?